Raising Jewish-by-religion children is an extremely significant measure, because it is almost exclusively those being raised as Jewish-by-religion who are provided with some sort of formal and informal Jewish education. This and other studies have shown that providing children with Jewish education has a measurable impact on the Jewish connectedness of the whole family, as well as on the adult connectedness of the children involved.21 The percentages of Jewish-by-religion children is only half as high among the intermarried as the non-married, and less than a quarter as among the inmarried. 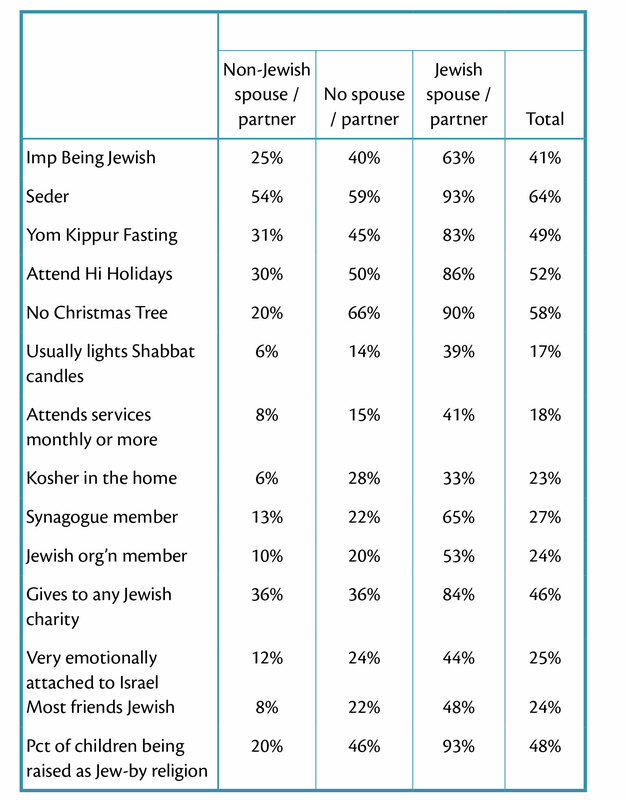 We cannot know the exact extent to which marital status influences Jewish engagement or to which prior levels of engagement influences getting married, staying married, and marrying a Jew or non-Jew. The causal process operates in both directions: Marital status is closely tied to levels of Jewish engagement.